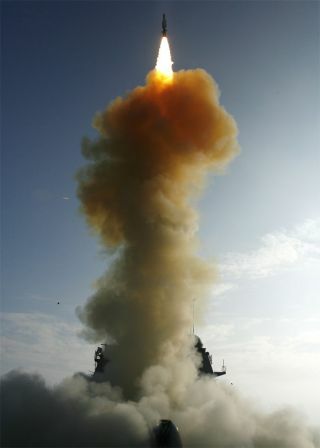 The Navy ship, USS Lake Erie, launched a Standard Missile-3 at a defunct spy satellite over the Pacific Ocean. The United States and China engaged in a show of military strength in space by testing anti-satellite weapons on their own satellites on separate occasions, according to diplomatic cables leaked by WikiLeaks and published by the U.K.'s Daily Telegraph newspaper today (Feb. 3). The memos include more than 500 leaked cables and detail the private fears of two superpowers as they clamber to dominate the new military frontier in space, the Daily Telegraph reported. The documents disclose that following China's intentional destruction of its own weather satellite in January 2007, the U.S. responded in February 2008 by blowing up one of its own defunct satellites in a "test" strike. At the time, the U.S. insisted that the maneuver was not a military test. Pentagon officials told reporters in the days before and after the test that it was necessary to destroy the American spy satellite — called USA-193 — just before it re-entered Earth's atmosphere to prevent it from returning to Earth with a toxic fuel tank that would pose health concerns. But, the leaked documents seem to suggest something else. "Teng Jianqun, Deputy Secretary General of the China Arms Control and Disarmament Department described the shoot-down as unnecessary and simply an opportunity to test the U.S. missile defense system," the memo stated. In the dispatched cable, Teng described the strike as "an ideal opportunity to voice their (the U.S.) objection" and proved "the U.S. missile defense system is also an offensive system." In another secret cable sent after the U.S. Navy missile destroyed the malfunctioning satellite, the American embassy in China received "direct confirmation of the results of the anti-satellite test" from the U.S. military command in the Pacific, according to the Telegraph. The Chinese anti-satellite test of 2007 destroyed one of the country's old weather satellites in orbit 530 miles (853 kilometers) above Earth, sparking widespread criticism and serving as a wake-up call for the White House. Another leaked cable from January 2008 showed that officials working for then-Secretary of State Condoleezza Rice issued a warning to Beijing. "A Chinese attack on a satellite using a weapon launched by a ballistic missile threatens to destroy space systems that the United States and other nations use for commerce and national security," the memo stated. "Destroying satellites endangers people. Any purposeful interference with U.S. space systems will be interpreted by the U.S. as an infringement of its rights and considered an escalation in a crisis or conflict." A month after this diplomatic protest, in February 2008, then-U.S. Defense Secretary Robert Gates authorized the U.S. Navy to fire a sophisticated rocket at the USA 193 spy satellite – the U.S.'s first anti-satellite test since 1985. The strike provoked tense talks between the two nations, and the leaked cables reveal that China claimed to be "neither allies nor adversaries" with the U.S. at a defense summit in 2008, the Daily Telegraph reported. The Chinese assistant foreign minister also expressed concern that the U.S. missile defense program "includes lasers that attack a missile in launch phase over the sovereign territory of the launching country." The latest secret memo obtained by WikiLeaks was sent from the office of U.S. Secretary of State Hillary Clinton in January 2010. It claimed that U.S. intelligence detected a successful anti-satellite missile test launched by the Chinese army about 150 miles above Earth. The cable expressed the Obama administration's shared concern with the former Bush administration over Chinese space weapons plans. In July 2010, the U.S. government told the United Nations that the country's new space policy will now at least consider measures to control arms in space, similar to other arms control agreements. The Obama administration is also set to release its Space Security Policy Plan this month.